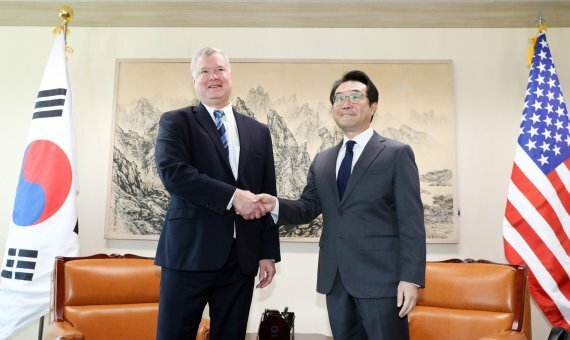 South Korea and the United States will have senior-level discussions on North Korea this week, Seoul's foreign ministry said Tuesday, as the two Koreas plan to hold a groundbreaking ceremony for their railway and road project next week. He will hold one-on-one talks with his South Korean counterpart, Lee Do-hoon, on Thursday, according to ministry spokesman Noh Kyu-duk. The following day, the two sides will have their second "working group" meeting, in which officials from the White House and South Korea's presidential office and unification ministry will also participate, he added. The working group talks will be composed of two sessions: one on denuclearization largely between Lee and Biegun and the other on inter-Korean relations. The second meeting will be led by Lee Dong-yeol, director-general for Korean Peninsula Peace regime at the ministry, and Alex Wong, deputy assistant secretary of state for North Korea and deputy special representative. In the working group, the allies will closely coordinate various issues related to North Korea, including inter-Korean relations, and coordinate strategies for "substantive progress" in efforts toward denuclearization and a peace regime, the ministry said in a statement issued earlier in the day. President Donald Trump has openly indicated that he's in no hurry for dialogue, while North Korea's foreign ministry has warned that it won't wait for a long time. In a statement issued Sunday, a senior policy researcher at North Korea's Ministry of Foreign Affairs, said if the US sticks to sanctions and pressure, it will "block the path to denuclearization on the Korean peninsula forever -- a result desired by no one." The two Koreas will hold a highly symbolic ceremony to formally start work to modernize and reconnect the cross-border roads and railway tracks at Panmun Station in the North's border town of Kaesong on Wednesday.